BT Sport is to stream a regular taster of its rugby union magazine show Rugby Tonight for free on social media platforms Facebook and Twitter providing potential subscribers an opportunity to sample the broadcaster’s popular innovative show. The weekly hour-long show will be shown on BT Sport channels, starting tonight from 8.00pm to 9.00pm, and the first quarter on BT Sport Rugby’s Facebook and Twitter feed. The first part of the programme will focus on questions and opinions from the social media platforms to some of the biggest names in rugby, and this will take place throughout the season. The new season of Rugby Tonight kicks off with special guest British & Irish Lions, England and Saracens star Maro Itoje. It is the latest move by BT Sport aimed at making its content available as widely as possible. Football results show, BT Sport Score, is streamed throughout the season live on Twitter. BT also made last season’s UEFA Champions League and UEFA Europa League finals available for free to as many people as possible, on YouTube, the BT Sport website, BT Sport channels and the app, underlining BT’s commitment to make televised sport more accessible to fans. Rugby Tonight is broadcast live from the studio, but this season will also see the show hit the road and travel across the country alongside Aviva Premiership clubs across the UK, showing the links between the professional and grassroots game with the show’s usual mix of insight and fun along the way. BT Sport has also launched a new sport predictor game, giving Aviva Premiership fans the chance to predict results, create private leagues to challenge their friends and office colleagues, and take on and take on the BT Sport rugby experts. To join the games and for a chance to win tickets to the Aviva Premiership Final, visit www.btsport.com/predictor. Since launching in 2013, BT Sport has broadcast live Aviva Premiership Rugby and is currently broadcasting up to 69 matches per season in top flight English rugby and extended highlight rights for all 135 matches in the competition. Since 2014, BT Sport has also shown at least 37 games in both European elite competitions per season with English club Saracens winning the European Champions Cup for the past two years. 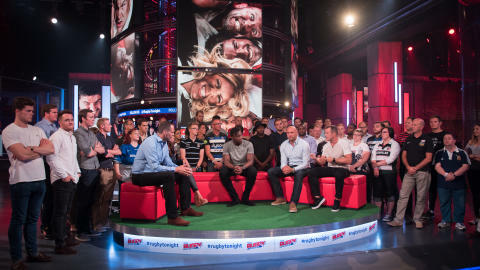 The public can also be a member of the Rugby Tonight audience for free – for audience tickets please e-mail audience@rugbytonight.com.